Banff is a picturesque town situated high in the Rocky Mountains in Alberta, Canada. There are three ski resorts within Banff National Park: Norquay, Lake Louise and Sunshine Village, all offering ideal conditions and amenities for newbies. Expect to see miles of gentle green and blue runs, surrounded by breathtaking scenery so beautiful that Banff was awarded a world heritage status. Norquay is the smallest area of the three, its quiet, wooded slopes making it ideal for that first day warm-up. Lake Louise has an abundance of natural snow and also possesses Canada’s largest snow-making system. It is a friendly mountain with an easy run from every chairlift making it ideal for wobbly beginners. 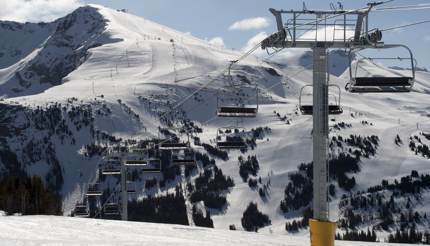 Sunshine Village is perhaps the most well-known of the three, thanks to it being featured in a number of movies and TV specials. It also enjoys the most snowfall of the three resorts thanks to its location, straddling the Continental Divide. Banff is relatively remote, and the nearest airport is Calgary International Airport, almost 120 km away. You’ll need to take a shuttle bus to get to the town from the airport, although driving is an alternative. Just be sure to leave yourself enough time if you do, as the journey can take hours and the wildlife is much more active at night, making the roads that much more dangerous. Top Tip: Banff is home to over 1,000 elk, so be careful not to plough straight into one of them. They are extremely common in the area and you might even see them wandering the streets. Favoured by the celebrities for its idyllic location in the Rockies and its luxurious slopes, you don’t have to splash the cash in the world famous ski resorts surrounding Aspen. The powdered slopes here can be enjoyed on a shoestring budget and are also perfect for beginners, with Buttermilk Mountain and Aspen Highlands in particular boasting a vast number of green and blue slopes. 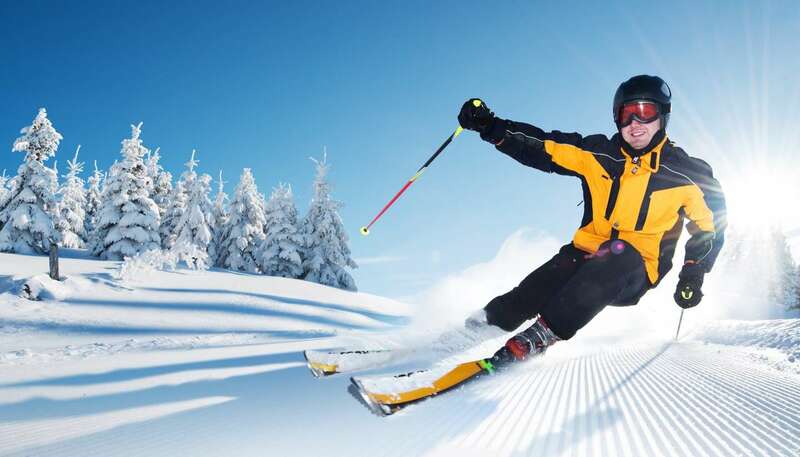 The ski school at the resort is also one of the best in the world and perfect for getting to grip with the pistes. Beginners flock to Buttermilk Mountain due to lack of traffic and the ease of the slopes from the top of the hill to the bottom, whilst enthusiasts use the other side of the resort to host multiple international competitions, including the Winter C Games. Travellers to this Colorado resort can also purchase an Independence pass which will provide them with scenic tours, take them to points of interest and show any landmarks along the way. The closest airport is Aspen-Pitkin county airport, which is a mere 10 minutes away from Buttermilk Mountain, but only accepts national flights from U.S airports. For international visitors the best stop is Eagle County Airport, which is approximately 70 miles away. Unless you’re willing to part with over USD $200 for a taxi there, you’ll want to rent a car for the hour-long (but very pretty) drive. Top Tip: For travellers partial to a few beverages, a visit to the Aspen Brewing Company is never a bad idea. What better way to warm up after a long day of skiing than to sample Aspen’s local beer? Soldeu comes alive in the winter as a thriving ski town and is one of the best beginners resorts in Europe. 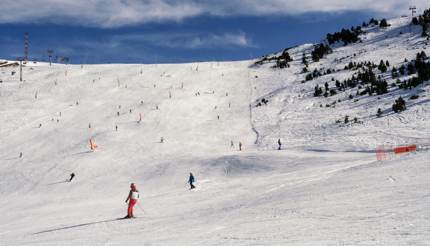 It’s part of the largest ski area in the Pyrenees, known as the Grand Valira. Soldeu’s unpretentious atmosphere and large, mostly gentle slopes, make it an ideal destination for rookie skiers. A moving carpet lift will elevate beginners to the mid-mountain range, from which there are plenty of easy runs. However, the pièce de résistance has to be the highly rated ski school. Run by an Englishman, Soldeu boasts excellent English-speaking instructors that will ease you through your first skiing experience and have you on the more challenging slopes in no time. Soldeu lies between several major airports, with the closest being Barcelona – El Prat airport and Toulouse – Blagnac airport. Each requires a two-and-a-half hour trip to get to the resort, but Novatel runs a daily minibus service from both of them. You’ll need to reserve a place on them in advance. Top Tip: Andorra is duty free, which means cheap prices all around. 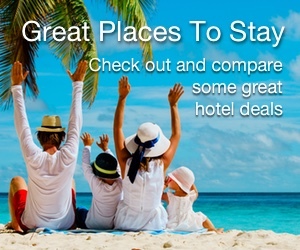 If you’re in the mood to party, it’s the perfect place to make the most of the lively nightlife. Situated in Savoie, in the Tarentaise Valley town of Bourg-Saint-Maurice, Les Arcs is a ski resort that specialises in getting beginners onto the slopes. The resort has five areas: Bourg-Saint Maurice, Arc 1600, Arc 1800, Arc 1950 and Arc 2000, all situated at altitudes ranging from 810 to 3,225 metres, although skiing is mostly possible above 1,200 metres. Les Arcs has nursery slopes that lie above the main villages of the resort and is home to the award winning New Generation ski school, currently run by Brits. Off piste opportunities are numerous, although you’ll want to find a good guide to make the most of them. Les Arcs and acquiring a guide for tours of the area is a must. Les Arcs offers some of the most extensive skiing in the world with a lift link to La Plagne via Paradiski, the perfect spot for uninterrupted skiing. The closest airport is Chambéry Airport, operating in winter only. It’s approximately a two-hour drive to Les Arcs, and serviced by both buses and taxis, though a private service can often be cheaper if you’re able to hire one. Many visitors also choose the more popular Geneva Airport, which despite being nearly four hours away offers regular shuttle bus transfers every 45 minutes. Top Tip: Les Arcs can be reached in eight hours simply by boarding a Eurostar from London St. Pancras, going all the way to Moutiers. 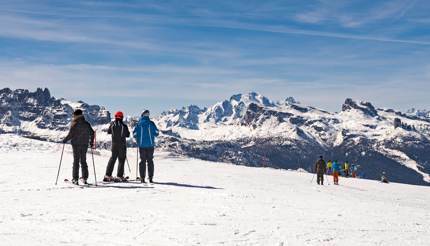 Known as the Pearl of the Dolomites, Cortina is one of the most renowned of all Italian ski resorts and boasts stunning scenery, rivalling that of any in the world. There is a typically Italian ambience about the place, with hotels, shops and eateries all oozing with style and class. Should travellers want to swap their skis for a more conventional pair of walking shoes, there are plenty of other activities to get involved with. Many people visit Cortina purely to be seen, not just to ski, so if you’re itching to get onto the slopes there should be every opportunity, and without too many crowds. The resort is renowned for being the 1956 winter Olympics venue and was also the location for the James Bond film For Your Eyes Only. The closest airports are Canova di Treviso Airport and Venice Marco Polo Airport, both one hour and 45 minutes away. Airport transfers are provided by Ski-Lifts.com in the form of private coaches, and there are regular buses servicing both airports. Top Tip: Be armed with your camera when sunset comes around. The peaks put on a colour display, turning every shade of mauve, pink and purple.